864%. 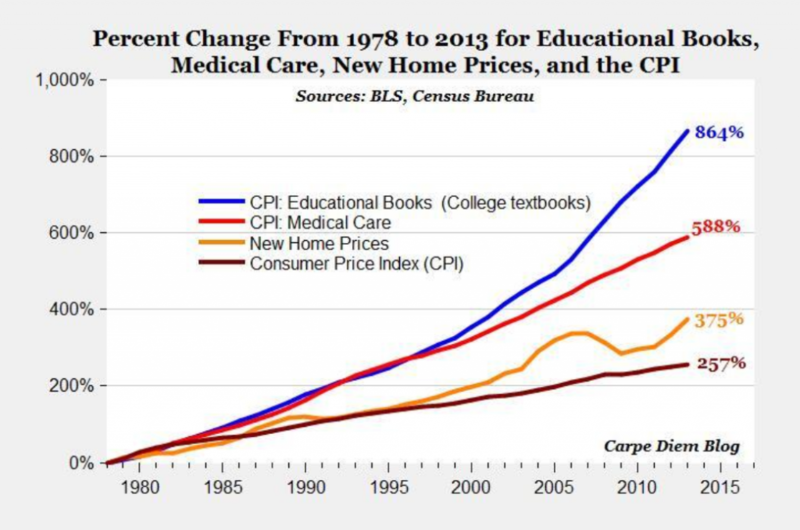 That’s how much the cost of college textbooks has increased since 1978. According to the College Board, the average student spends $1,200 per year on textbooks. Note the word “average,” suggesting that about half of students will spend more (sometimes significantly more) than that. That’s about 14% of the tuition and fees at a public four year college. That’s a sizable chunk of change. This isn’t exactly news. Almost a decade ago, the Government Accountability Office released a report stating that “college textbook prices have risen at double the rate of inflation.” The report was apparently ignored by most, as college textbook prices have continued to rise at an insane rate. Part of the problem with college textbook prices is a lack of competition, which is also felt in the K-12 textbook market. Just as “The Big Three” (Pearson, McGraw-Hill, and Houghton Mifflin Harcourt) control the K-12 publishing industry, the college textbook industry is also dominated by a small handful of giant publishers (including The Big Three). But another part of the problem is that the students who purchase these books have no choice in the matter. If the professor says, “Buy this book,” you sort of have to buy that particular book. Students don’t get to shop around to see if maybe textbook A is better than textbook B. They are a captive market. Thus we have a situation in which prices keep rising, and students keep buying. What can you do about it? Do not buy your books at the campus bookstore. Yes, it’s convenient. It’s also incredibly over-priced. You may need to buy some smaller items at the campus bookstore – like packets printed by professors for specific classes – but most textbooks can be purchased far cheaper elsewhere. Don’t waste your money. Do not buy brand new books. Guess what? Books don’t generally expire. They don’t get stinky (in fact, I rather enjoy “old book smell”). Unless your professor absolutely insists that you have to have the newest edition that JUST CAME OUT THIS YEAR, buy a used copy of the book. (And even when the professor does insist, you can often get away with using a slightly older edition with little inconvenience. They don’t generally change that much.) Get the ISBN for the book and search on Amazon, Barnes and Noble, book.ly, or half.com. Face it – your textbook will not be such a page turner that you return to it again and again to reread its beloved dog-eared pages. You’ll never look at the thing again. So why not rent your textbooks? Business Insider has a list of 7 sites that provide textbook rental or swapping services. It’s definitely an option worth checking out. You do research and compare prices when you’re buying a computer, a car, or other big purchases. Why wouldn’t you do the same for textbooks? Shop around. Compare prices. And if you find that too onerous, use a comparison tool like SlugBooks or BIGWORDS to do the legwork for you. Thanks to the internet, textbooks can also be found online. Taking an English Lit course? Lots of those classic pieces of literature are available for free at Project Gutenberg. 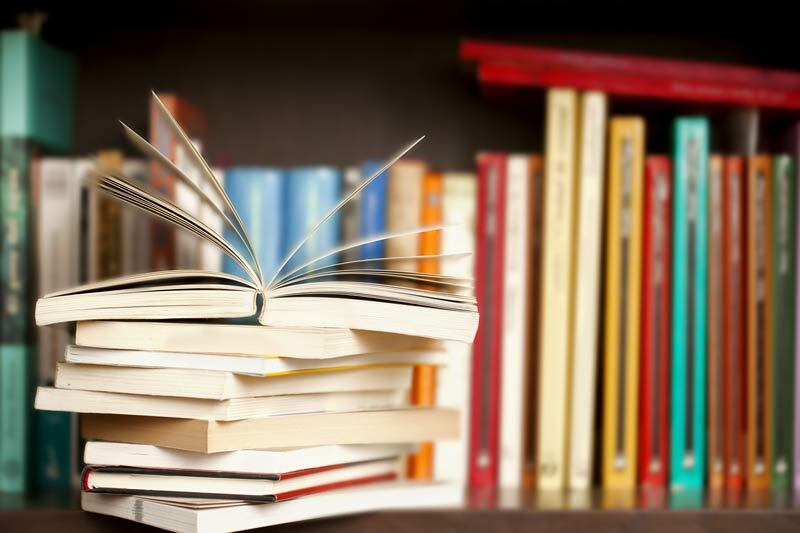 And for other courses, check out a service like CourseSmart, created by five big textbook publishers to provide less expensive e-book formats of popular textbooks. Many colleges provide copies of textbooks at the library. City and county libraries also often carry copies of some textbooks. A caveat: Those copies go fast, so you have to be the first one through the door to take advantage of this freebie. Students who took the course last semester will be more than happy to lend, sell (cheaply), or swap textbooks. Like you, they don’t need that bulky overpriced book hanging out in their dorm room. Check campus bulletins, Craigslist, and online marketplaces to find other students willing to lend, sell, or swap their books. I love books. I love owning books. I have shelves and shelves and shelves of books. So I get the impulse to hang onto any book you’ve spent money on. But when it comes to college textbooks, unless it’s a book related to your major that you think you’ll need to reference again and again, don’t cling to the book. Sell it. And don’t sell it to the campus bookstore, where they’ll give you a tiny fraction of what you paid. Sell it through some of the used book vendors mentioned above. https://www.c2educate.com/wp-content/uploads/college_textbooks.jpg 533 800 C2 Education https://www.c2educate.com/wp-content/uploads/logo.png C2 Education2014-04-30 02:50:312018-01-29 21:44:01College Textbooks Cost WHAT?